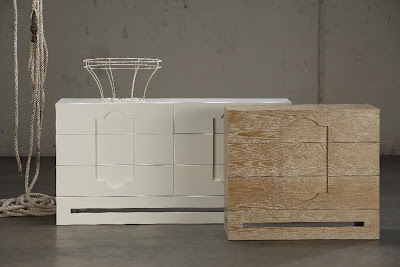 The Casablanca Chest offers modern versatility and strong solid forms. Go bold and choose the 60"Long 6 Drawer chest for an ultimate anchor piece for any size room. Or choose the smaller Casablanca 3-Drawer Chest finished in washed oak for an urban glam feel with a touch of beach. Fresh + flirty. white glossy. tufted vinyl. Yes, the coolest modern glam round ottoman I've ever seen. Perfect for the urban girl who likes to live a little on the edge. Besides, nothing should be off limits when it comes to home fashion. 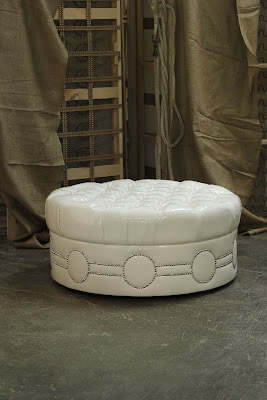 The Manhattan 42" Round Ottoman, with a fabulous nautical silver nail-head design, was inspired by product designer Susan Ortiz's recent summer sailing trip through the Greek Isles. With traditional lines and a modern twist, comes an ultra posh wing-back shown in Alligator Croc Vinyl in Pure White with glam nail-head trim ~ pure fabulous. 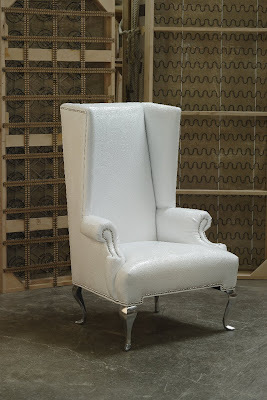 The Master's Wing Chair is available in a variety of fabrics, including COM, and is adored with cast aluminum polished chrome legs. 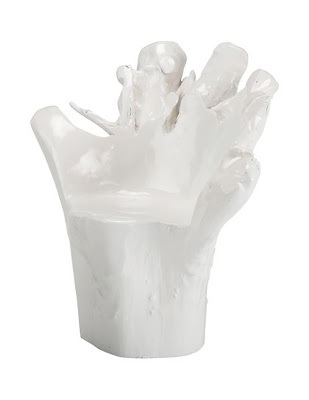 For the ultra modern glam lifestyle, choose this art inspired sculptural chair. The Lucerne Small Accent chair comes in glossy white lacquer over hand carved wood and is the perfect addition to any art lover's modern loft. Design Inspiration: wanting to reinvent and push the envelope, combined with a love of free form natural wood carved pieces and organic sculptural shapes, Susan used her background in film/photography/sculpture to create an avant-garde museum piece. Susan Ortiz, co-owner and Designer of Shine Home, discovered a group of global artisans in Nigeria during her recent Summer Travels. After falling in love with the indigenous people of Yoruba and admiring their passion for hand-made artistry, she created the "Yoruba Tribe Originals Collection." 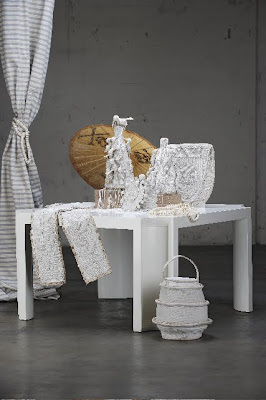 This collection reflects the pure beauty of white and the organic nature of hand-made. 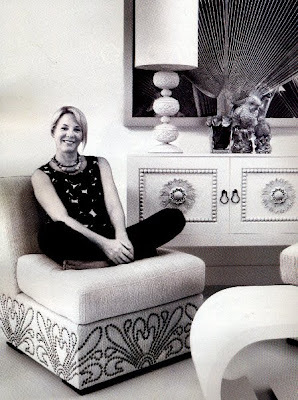 With a globally eclectic design sense, mixed with an artist background, Susan Hornbeck-Ortiz creates one of the most fashion forward lifestyle lines in the furniture and interior design industry. 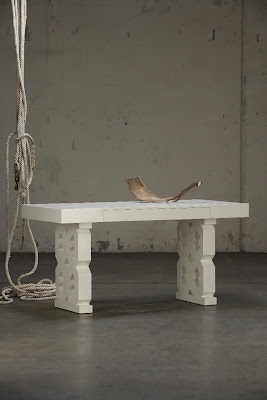 This world traveled, mulit-faceted artist, with a Masters in Fine Arts in Sculpture & Installation Art from UCLA, takes freedom in form and is not afraid to design avant-garde case pieces and upholstery outside the norm of today's traditional furniture manufacturers. Shine Home has been featured in numerous design publications such as, Metropolitan Home, O at Home, Elle Decor, House Beautiful, and more. You can also find the Shine Home Collection in the fabulous "S Bar" in LA designed by Phillipe Starck...amazing! To learn more about Susan and The Beauty of Shine Home, please visit her website at www.shineeveryday.com. 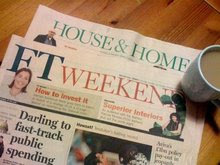 Click on the following link to view the urban glam goodness of the new Shine Home Fall 2009 Collection. 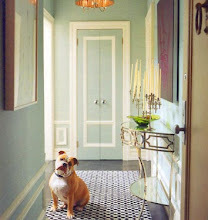 Also, make sure to come join the fabulous design + decor conversations with Susan on Twitter at @shineeveryday. What a beautiful collection! I really like the third table down. The geometry is really nice. I'm loving the ottoman! SO cute! Susan, I nominated you for the Kreativ Blogger Award. I was given the Blog Award, Kreativ Blogger, and had to choose 7 other blogs worthy of the award. You’re one of my choices! Susan, Thank you for this amazing post on my social media client, Shine Home. Susan is a visual artist of the first order and I am so grateful to see her work portrayed so beautifully on your blog. I encourage your readers to view even more videos of her amazing furniture colleciton on her YOU TUBE channel: shineeveryday11. At the end of November, she will also be introducing her completely revamped website at www.shineeveryday.com nd then in January, East Coast designers and all others attending can see her latest collection at the New York International Gift Fair! Love your "dream loft".. gorgeous! This is such a great collection! I’m new here to your blog and wanted to “pop” in to say hi! : ) Love your blog! Its beautiful! !